Turn your words into pictures with StoryBoard Quick. The best, fastest way to communicate your shot and scene ideas. No complicated 3D. No cartoony stick figures. No time-consuming drawing. 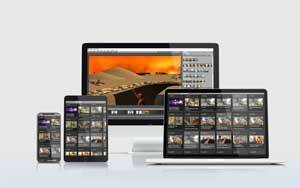 Simply click your way to creating the best shots for your videos. We created StoryBoard Quick for directors who couldn't draw. Users find that StoryBoard Quick cuts the visualization time in half or more. Quick is our entry-level product used by directors, writers and auteurs who want to quickly prototype their project. For more depth see our advanced StoryBoard Artist software which adds sound, timeline, transitions and animatics for your feature projects. And it's still quick to use. Choose characters, props and locations from the extensive art libraries to create your shots! Or add you own art to the panels. Show your boards in many professional formats with captions next to each frame for perfect communication of your story. Brainstorm quickly to try new shots and decide before you get to your shoot. Revisions are quick and easy. Saves time and money. Fast and easy shot creation with libraries of artwork included: characters, props, locations. Design, refine and share your ideas visually. Drop in your script and start visualizing. After all, you're going to shoot the project, not make it perfect in the computer. Be creative, try ideas fast and pick the best ones to shoot. Pitch producers like a pro. Use characters that take up volume and space to show your DP how you want your shots and scenes to look. Present your ideas in style. Say goodbye to stick figures. No need to rely on online connection or webservers to access your work. It's your work. Keep it private until it's time to show the world. 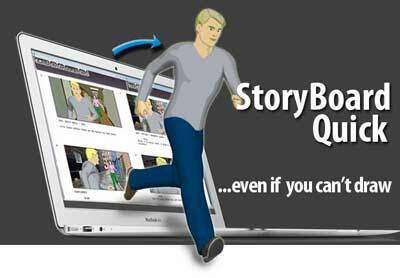 StoryBoard Quick is a great tool for rapidly creating a storyboard. Even if you are artistically-challenged, you can still get up to speed and create compelling storyboards for your project in less than 30 minutes. I've had StoryBoard Quick for a while now and love it. I print all the day's panels for every camera and post them above the craft services table. Then everyone knows exactly what is expected and we can do 40 setups in one day! The producers love it! We were shooting a unique sequence, different from our usual three camera set up. I needed to show them how I envisioned 'the car running over Oprah sequence.' So I opened my laptop, fired up StoryBoard Quick and in a few seconds we were all on the same page for the series of shots. WANT QUICK PLUS MORE ?